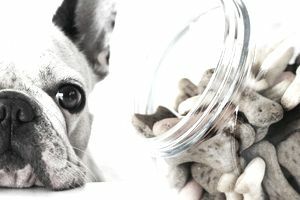 Many dog owners treat their dogs like members of the family and love to give them healthy, homemade treats. Plus, some dogs have special diets and need custom-made treats to adhere to food restrictions. In either of these cases, a dog treat bakery that makes and sells high-quality products to the right clientele can be a profitable business. You can run your business entirely as a home-based business. Dog treat bakeries have the potential to do well when products are sold online. The target market is quite varied including online sales, pet boutiques, pet stores, vet offices, doggie daycares and grooming facilities. You can get very creative in developing treats that dogs will love. There are franchise opportunities available. Gourmet pet treats are not in demand in all areas. You must follow specific regulations for processing homemade dog treats. There can be significant legal issues if the treats are not produced according to regulations. You will have to research what local permits are needed. Startup costs can be expensive if you go the franchise route. You will need a kitchen area, baking equipment and supplies. You will need to test your recipes prior to selling.